We offer a comprehensive range of fully fitted parking sensors and reversing aids ranging from 2 sensor kits all the way up to 8 eye kits with reversing cameras and LED displays. All our professional parking sensor kits look discreet and are similar in appearance and style to most of the vehicle manufacturer factory fitted options. Detection Range 60-80cm front and 120cm rear. 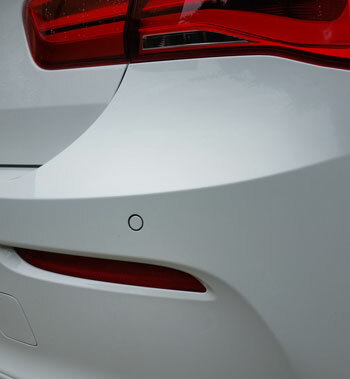 For more information or to arrange an installation of parking sensors contact us today. Flush fit sensors are a perfect match for the original sensors. We colour code them to the exact colour and carefully fit them to your front/rear bumpers. They give an audible series of tones inside the vehicle to warn you of and obstacles.